Hacker Chris Paget figured out how to enable USB host mode on the Motorola Droid, a smartphone running the Google Android operating system. What's so special about USB host mode? Most smartphones and MP3 players, including the Droid, are designed to be passive devices and only act as peripherals when plugged into a host computer. But the USB On-The-Go (OTG) specification lets phones serve as the host device--supplying power and acting as a bus controller--for other peripherals, including other smartphones. This new hacks lets your phone be a host to a variety of devices, and you don't even need to root your Droid for this purely-hardware hack to work! To get your Motorola Droid to work as a host for other peripherals you'll need three cables: a car charging cable, a Micro USB cable, and a USB extender cable, all readily available at a Verizon store or a local electronics store. Once you've spliced, soldered, removed a resistor, and plugged the resulting FrankenCable to your phone, all you have to do is reboot and type one command into terminal to start having peripherals be recognized by your Droid. 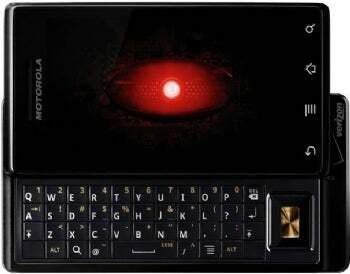 In addition to host mode working on the Droid, other hackers have extended USB OTG capabilities to other smartphones: Andrew de Quincey showed that you can plug a USB keyboards into the HTC Hero. While the Android kernel at present doesn't have a lot of support for peripherals, perhaps ROM developers will start adding USB drivers to their software. What sort of peripherals are you planning on plugging into your Droid now that you can get it to work as a USB host?